REMOVE GRAFFITI NOW with Tensid’s proven brand of powerful GRAFFITI REMOVERS for brick, stone, concrete, masonry, polycarbonate, metal, glass and tile. Tensid is well-known throughout Europe and the UK for successful innovation! Established over 25 years ago, Tensid developed a complete set of proven graffiti removal products that are used today throughout Europe and the UK as the BEST way to safely remove, and protect against, graffiti. Tensid UK set THE benchmark for safe and effective graffiti removal products that handle even the toughest graffiti removal, while protecting the surface and the user. Other companies may try to imitate, but Tensid is always there, supplying the right products and equipment to help councils, contractors and individuals to get rid of graffiti, while being highly cost-effective and efficient. Tensid’s range of powerful graffiti removal products are used by councils, graffiti removal contractors and specialists throughout the UK and Europe. Tensid’s graffiti removal chemicals are kinder to the environment, safer for the user and will remove graffiti quickly from virtually any surface, SAFELY AND EFFECTIVELY. 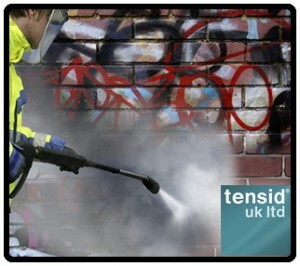 See Tensid’s range of graffiti removal products below. Or, learn how you can PROTECT AGAINST GRAFFITI in the first place by using Tensid’s anti-graffiti coatings. To do the job well, you may also need to buy or hire a pressure washer. Tensid specializes in professional mobile, hot water pressure washers that will clean grime, graffiti, gum – and just about anything else! GRAFFI WIPES are a special cloth wipe impregnated with an advanced graffiti remover. The wipe will remove graffiti made by marker, felt and ball point pen from most painted, plastic and hard surfaces. Graffi Wipe is safe for use on polycarbonate, as it will not etch nor leave the surface ‘milky’ in appearance. GRAFFI CLEAN 300 graffiti remover. Get graffiti off masonry! NMP-free viscous graffiti remover/paint stripper for use on masonry surfaces. It is a gelled graffiti remover that will cling to the surface while it works to remove graffiti. GRAFFI GHOST graffiti remover. Get rid of the visible remnants of graffiti! GRAFFI GHOST REMOVER can be used following the initial graffiti removal with other Tensid graffiti removal products, in cases where graffiti ghosting, graffiti staining or graffiti shadowing remains visible on the surface. GRAFFI GHOST GEL. Tough graffiti removal action on graffiti stains and shadowing. GRAFFI GHOST GEL can be used following the initial removal of graffiti with other Tensid products, especially in cases where graffiti ghosting, graffiti stains, or graffiti shadowing remains visible on the surface. GRAFFI GHOST GEL is also in ideal cleaning agent for the removal of soot, grease and oil substances. GRAFFI GHOST RINSE. Tough and safe graffiti removal action on graffiti stains and shadowing – for use with GRAFFI GHOST or GRAFFI GHOST GEL. GRAFFI GHOST RINSE is a graffiti removal product for removing any remaining graffiti stains or ghosting. GRAFFI GHOST RINSE is normally used following GRAFFI GHOST or GRAFFI GHOST GEL. This acidic after-rinse will fizz-out remaining graffiti ghosting while at the same time stabilising and neutralising the pH. GRAFFI GHOST RINSE is also an effective general purpose concrete and brick cleaner. It will remove rust, oil, mud, atmospheric dirt, mortar smears and many other stains. GRAFFI GHOST POULTICE. This strong and safe safe graffiti removal poultice is a paste that removes the stains and shadows of graffiti. It works by oxidising away traces of pigments and by breaking down grease and oil residues in the substrate. The poultice is specially formulated for the removal of difficult ghosting and is suitable for most surfaces. We are confident you will like Tensid’s GRAFFITI REMOVERS. Want to try Tensid’s GRAFFITI REMOVERS for yourself? We are happy to supply a sample for professional testing. To order a free sample, fill-out the FAST TRACK SAMPLE form. Do you have a graffiti removal question? Tensid’s technical experts love questions about ANY graffiti removal situations… CALL TODAY at 01932 564 133 to talk to a friendly graffiti removal specialist who can answer your questions. Tensid is renowned for EXCELLENT CUSTOMER SERVICE. We’re here for you. Call 01932 564 133 or contact us online to learn how Tensid’s products can help you succeed in solving problems while saving money.